A sprained ankle, ankle sprain, rolled ankle, ankle injury or ankle ligament injury, is a common occurrence where one or more of the ligaments of the ankle is torn or partially torn due to excessive torsional stresses placed on those ligaments. The anterior talofibular ligament is one of the most commonly involved ligaments. 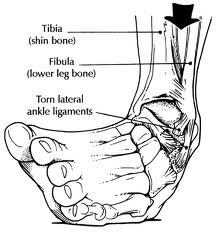 Sprains to the lateral aspect of the ankle account for 85% of ankle sprains. These are called "inversion" ankle sprains. These type injuries can happen at any time but are most often seen in sporting activities or where ill-fitted shoes are being worn. Call Vancouver Orthotics at 604-737-3668 for more information. How do I best treat ankle pain? What is the expected ankle sprain recovery time? What are the best ankle sprain exercises? How should I perform effective ankle sprain rehab? Ankle sprains can become chronic if not treated properly. In fact we`ve seen patients at our office who after 6 months after the initial injury still display inflammation, weakness and instability. So proper treatment is essential to prevent future repetitive strains and to regain complete function.